Active and outdoorsy, Rob decided he would propose the only way we knew how, outdoors among the majesty of nature. 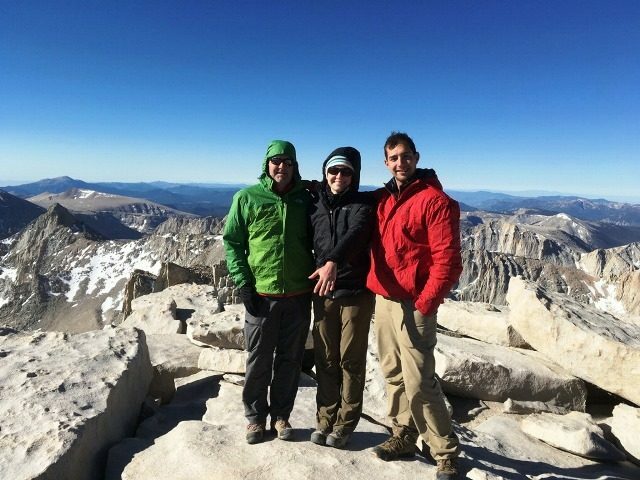 In fact, proposal planning began back in January when we finally received permits to hike Mount Whitney, the tallest peak in the contiguous US. Because my dad would be accompanying us on a week-long backpacking trip along the High Sierras in California all the way up to Mount Whitney, my parents were fully aware and in cahoots with Rob the whole time. 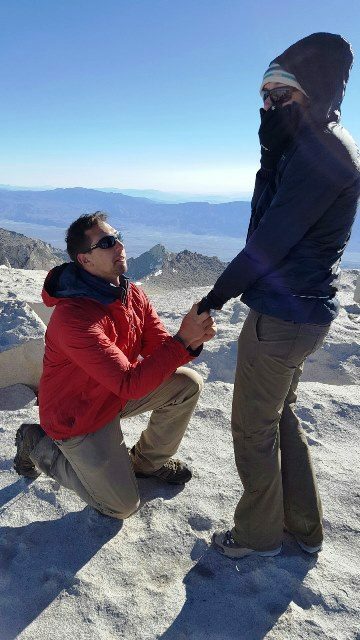 Rob knew he wanted to propose at the top of Mount Whitney, so my parents helped make it happen. In fact, up until we reached the summit, my dad held on to the ring for safe keeping in a vacuum sealed bag. Here we were, 4 days into our backpacking trip. We had gained over 5,000 feet in elevation and hiked over 50 miles to get to Trail Crest, 2 miles away from the summit of Mount Whitney and 2 miles away from the pinnacle of our trip. Little did I know I was also 2 miles away from being proposed to by the love of my life with my Dad to witness the beautiful moment. We dumped our heavy gear, – each of us carrying 40-lb packs-, in lieu of light day packs. We packed our water, snack, layers, and that’s when Dad slyly packed the ring and his multi tool for cutting the bag the precious cargo had been safely carried in. With our daypacks on our backs and optimistic hearts, we were off into the wind-chilled unknown, tired from beginning our journey that day at 3 AM, but so excited to summit. It took us 2 hours of treacherous snow crossings and navigating boulders to get up to the peak. Finally, we were at the top. All was quiet. The morning sun was warm on all our faces, welcoming us to the summit of Mount Whitney. We had made it! Little did I know we were all minutes away from receiving our ultimate reward: a proposal… my proposal! At the summit, Rob and my dad made a subtle exchange, shook hands, and cut the ring bag while I was looking in the opposite direction enjoying my inhibited vista views. As calm and collected as Rob could ever be, he walked up to me and got down on one knee. Stunned and shocked from the events unfolding and from the lack of oxygen up at that height, I became overwhelmed with emotion. Onlookers cheered, cried with us, and snapped photos as they witnessed such an intimate expression of love as I said yes and Rob and I embraced. My dad, just as emotional, snapped as many photos as his frozen hands could. Afterward, my dad handed us both 2 notes; one from him, and one from my mom who was selflessly waiting for our safe arrival home. Rob and I read these notes of congratulations and love with smiles on the summit, over 14,500 feet up. Even though my mom was not able to be there in person, it was so special to know she was there with us in spirit until we were back on solid ground to celebrate. As we made our decent, news spread quickly. Other hikers had heard of our engagement and congratulated us all the way down. Our engagement will forever be the pinnacle moment of a trip of a lifetime and the beginning to the rest of our lives. We won’t ever forget! Elizabeth	Schroeder	& Robert Peers	were happily engaged on 06/23/2016	.